PASADENA — Nakamura Gankyō (a.k.a. 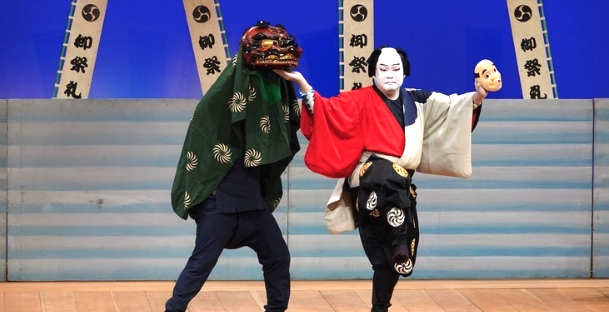 Bandō Hirohichirō) and his students will perform selections from kabuki plays as well as demonstrate what goes into creating a kabuki character through performance on Thursday, March 28, from 7 to 9 p.m. at USC Pacific Asia Museum, 46 N. Los Robles Ave. in Pasadena. Nakamura has been studying Japanese classical dance since the age of 3, under the instruction of Madam Bando Mitsuhiro of Los Angeles. At the age of 23, he was apprenticed to National Living Treasure Sakata Tojuo IV (then Nakamura Ganjiro III), making him the first non-Japanese citizen to be accepted into the kabuki theater in its over-400-year history. He has received both his natori (master’s degree) and shihan (Ph.D.) in Japanese classical dance. Audience participation encouraged. Cost: $15, with 15% discount for members and $10 discount for USC students, faculty, and staff. You will be asked to show your ID at the door. Email [email protected] for your discount code. Upcoming programs include Artists at Play’s 2019 Spring Readings in partnership with the museum. Admission is free and includes a post-show talkback. Continuing their mission to present stories of underrepresented communities, Artists at Play will develop and showcase these new works to the Los Angeles theater community. In the midst of a national discussion on the lack of diversity and representation, they are proud to present two new plays by playwrights of Asian descent featuring a diverse cast. Thursday, April 4: “Bonobos” by Lina Patel, directed by Sara Israel. Featuring Melinna Bobadilla, Julia Cho, Christine Corpuz, Sunil Malhotra, Michael Martinez, Amy Weaver and Corey Wright. Four women extricate a friend from a bad relationship. Chaos ensues. A darkly comedic telenovela for the stage, “Bonobos” looks at female friendships and loyalty and wonders, why can’t two wrongs equal a right? Thursday, April 11: “This Is Not a True Story” by Preston Choi, directed by Reena Dutt. Featuring Lisa Sanaye Dring, Rob Nagle, VyVy Nguyen and Jenny Soo. The heroine of “Madame Butterfly” completes her tragic suicide, only to wake up trapped in a never ending loop of her story. Then “Miss Saigon” is born, thrusting another heroine into the deadly cycle, until a mysterious office woman throws the world out of balance. “This Is Not a True Story” unravels the history of Orientalist art, theater, and the danger of fiction becoming reality. For more information, call (626) 449-2742, email [email protected] or visit https://pacificasiamuseum.usc.edu.